Guests of this Zagreb hotel will be located in the eastern part of the city nearby to the freeway that leads to the city center. The Martini Hotel Zagreb places guests nearby to many of the area’s restaurants, shops, entertainment venues, and nightlife options, and it is also close to many main business addresses. The Martini Hotel Zagreb is easily accessible by car, and guests can get to many of the area’s attractions on foot, as well. The hotel is also accessible on the city’s public transportation system. This hotel’s rooms are also decorated in bright colors, and they all offer amenities like en suite bathrooms, direct-dial telephones, and televisions. The Martini Hotel Zagreb offers rooms in single, double, and triple sizes, as well as a larger apartment-style room or two. The Martini Hotel Zagreb is modern and comfortable, and it offers its guests a variety of amenities, including a dining room and café where they can enjoy a variety of meal and drink choices. 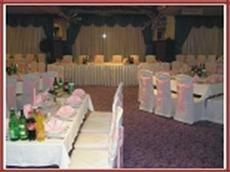 The hotel also offers plenty of space for wedding parties and other get-togethers, and it is decorated in a bright, funky style.